After taking care of our valued group practice users, we have turned our attention to the patient-facing interfaces. From speaking with many of you, we know that patient self-service is the key reason you have joined DocMeIn in the first place, looking to provide a more convenient way for patients to write themselves into your calendar. We are called DocMeIn.com for a reason — and we want the doc-me-in process to be as frictionless and effective as possible for both doctors and patients. 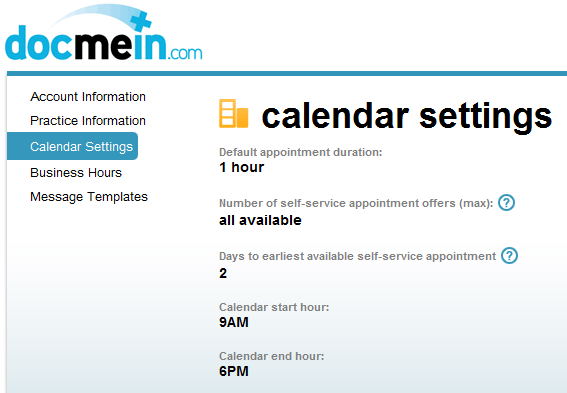 the ability to block off a certain number of days before the first self-service time slot is made available to patients. Also note that in this example the practice does not accept appointment requests made online less than 2 days in advance. Previous Post How big is your practice? Make it as big as you want! Please contact support@docmein.com if you are looking for DocMeIn technical support.